Catch up with the fourth industrial revolution, and keep transactions on track using a Blockchain platform. Offering infrastructure and services that can be deployed across all industries, including the finance sector, NexledgerTM is a Blockchain platform built for enterprise, empowering your organization to take control of distributed transactions securely and conveniently. What can NexledgerTM do for you and your business? Analyze for efficiency and identify the right course of action with Samsung SDS’s unique Blockchain Value Assessment (BVA). Go for speed and efficiency regardless of industry, channel, or location with the exceptional scalability of Nexledger. Build an easy and secure system with high performance and detailed management monitoring features with our Blockchain platform. Designed and developed for enterprise, Nexledger gives you a no-limits approach to grow your business. Nexledger is a Blockchain platform built for enterprise, empowering your organization to take control of distributed transactions securely and conveniently. Digital Identity Let your customers enjoy a convenient user verification service when connecting with affiliated companies by providing them with a one-time signup Blockchain ID. Digital Payment Enable customers to directly initiate and confirm financial transactions with one another. Because of Blockchain’s unique characteristics, transaction histories are accessible by all participants. Digital Stamping Create secure digitally-stamped digital signatures without the need for third-party authentication. Securely manage digital documents with time stamps using immutable Blockchain ledgers. Check new blocks creation and Blockchain network activity status in detail with the management monitoring system. Go beyond simple sharing of transaction histories and automate your transactions with Smart Contract. Verify and share transaction histories in real time for even service sectors that process high volume transactions. Financial Institution Authentication A host company can take the initiative and share customer identification info stored within the blockchain system for synergistic effect between financial institutions. Full Digital Economy Privacy control for customers is essential for full Digital Economy and blockchain can be used to securely manage sensitive customer info. Customer identification info required for authentication are encrypted within each customer’s device and can be sent to a requesting company on demand. Digital Payment Platform The Digital Payment Platform is a blockchain integrated platform that supplements various types of payments and can usher in a cashless society. Direct Payment The Direct Payment service enables card companies and banks to implement a blockchain based payment module platform to reduce dependencies on third party mediatory institutions. Blockchain payment network guarantees reliable transactions and renders forgery and tampering attempts nearly impossible. e-Document Authentication The e-Document Authentication services can be used for time stamping of electronic documents without the need for any third party authentication system, and enables cast savings and lowers risks from operations. 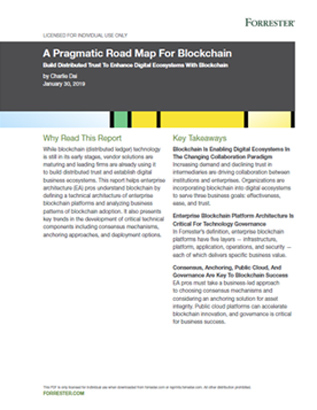 - This independently researched report presents how Blockchain builds distributed trust to enhance digital ecosystems, along with a technical architecture of Blockchain platforms. - Forrester included Samsung SDS Nexledger in a list of business cases to show how Blockchain adds value across industries worldwide.